The Workhorse CM-3 Deluxe features a curly maple figured neck and resonator along with nickel plated hardware. The satin nitro-cellulose lacquer finish with light golden brown stain creates an impressive look and feel. The Workhorse is a true professional-grade banjo at what we believe is an affordable price. 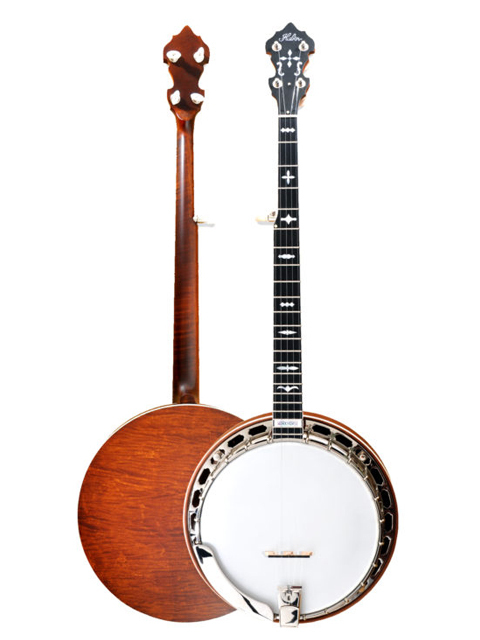 We are proud to say this banjo is built in our shop in Hendersonville, Tennessee. The 844 tone ring used in every Workhorse is poured at the same foundry as our HR-30 ring and machined right here in the shop to the same pre-war specifications as all of our tone rings. The banjo has a classic 1930’s look (because we love pre-war banjos) with a double-cut peghead and our 1941 “leaves & bows” inlay pattern. The satin nitro-cellulose lacquer finish with golden brown stain creates a great look and feel. Now, the Workhorse provides an entry-level, professional grade instrument that could become a lifetime banjo for our customer. Highly-figured flame maple is used for the Workhorse CM-3 necks. Huber necks are known to be the most comfortable and easy playing necks being made today. Produced using computer aided machining technology, each neck is crafted to the exact specifications every time! Matching the grain in the neck, the Workhorse CM-3 resonator has an overlay of highly-figured flame maple. Our new “844′ Tone Ring is actually no stranger to the Huber shop. We have been making this tone ring and private labeling it to other builders for the past 12 years. It is a leaded red brass alloy that makes a great tone ring. The Workhorse banjos provides us, for the first time, the opportunity to offer this tone ring under the Huber brand. The “Workhorse” series banjos all have a classic 1930’s look (because we love pre-war banjos) with a double-cut peghead and the 1941 “leaves & bows” inlay pattern. In a deviation from the pre war specs, we use a two way adjustable truss rod in our necks. The two way rod allows for adjustments in both directions – you can add relief or reduce bow as needed. The rod is accessible through a cavity in the headstock, just behind the nut. Our “Workhorse CM-3” model is finished in a light golden brown stain and satin lacquer. The sides of the resonator and neck are bound in white binding. Like the storied pre wars which inspired them, the “Workhorse” series banjos have a Presto-style tailpiece installed during final assembly and set up. we feel that the lighter weight of this sort of tailpiece is best suited to the sound he is after, and admires the simplicity of the design. It does the job and looks the part. The Huber bridge is made of carefully selected maple and designed for tone, volume and clarity. A special glue is used between the ebony and maple to ensure maximum vibrational transmission. String slots are cut with a custom-built slotting machine that produces the exact depth, spacing and angle every time.As a part of the final assembly and set up process, Steve will try several bridges on each new banjo until he finds one that “agrees” with the tonal voice of the instrument. The Huber bridge is also available as a separate accessory item order. Through a special arrangement with Remo, Huber installs a head on each new banjo that is manufactured to his custom specifications. Steve finds that they offer a superior tone to that of the stock Mylar heads offered for banjo. These Huber heads can also be ordered as a separate, after-market accessory item. The pot-metal flange we use in all Huber Banjos is custom machined in a process which allows for more solid contact between the flange and rim, resulting in better structural stability and tonal response. On all our models, we use a brass notched tension hoop, plated to match the other metal parts. We use plated steel rods to hold the neck onto the rim instead of the softer brass found in many new banjos. We chose steel rods since the older flatheads used them and, proving that no detail is too small, even the nuts and washers are exact pre war replicas!